The Mitchell Spring Assisted Dobbs Brace comes in two sizes, Small (15.25cm – 22.86cm) for children up to 1 year old and Regular (22.86cm – 35.56cm) for children over 1 year old. Due to the difference in spring tension between a small and regular size bar, we recommend that children under 12 months of age use a small size bar with the lighter spring tension and children over 12 months use the regular size bar with the heavier spring tension. WARNING: A regular size bar should not be placed on a child under the age of 12 months. The spring tension in a regular size bar is much heavier than in a small size bar and could overpower the child’s feet causing pressure on the skin. 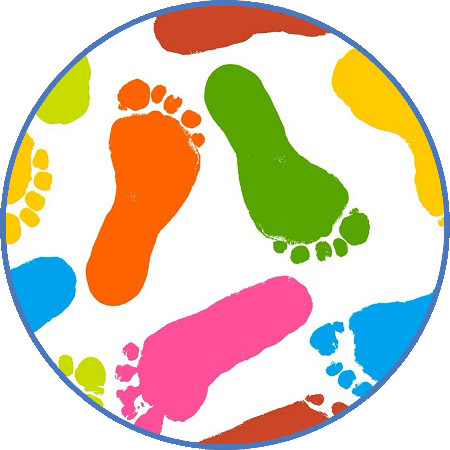 It features the ‘Quick Clip’ system for use with Ponseti AFO Sandals and lets children move their feet independently whilst maintaining abduction. The spring assist provides a dynamic stretch on the calf allowing patients to build calf muscle strength while moving and playing in the brace. This should be set so that the width of the bar is equal to the shoulder width of the child. We recommend that if the shoulder width of the child measures 20.5cm (8 inches) or above that you purchase a regular size bar since the child will outgrow the small size relatively soon and the regular size starts at 22.86cm (9 inches). Whilst not part of our formal Instructions for Use the following advice stems from practical experience, we hope you find it useful. Consistently follow the bracing protocol prescribed by your clinician. The Brace will not inhibit your child’s development. Providing the instructions are followed the brace will not cause discomfort to you child. The Mitchell Spring Assisted Dobbs Brace comprises an adjustable bar with the AFOs attached to the ends. babies and children whose clubfeet have been corrected by manipulation followed by serial casting and possibly a heel cord tenotomy. Typically such correction will be carried out in accordance with the method described by Dr Ignacio Ponseti (the Ponseti Method). For unilateral cases, the brace is set at 60 to 70 degrees of external rotation on the clubfoot side and 30 to 40 degrees of external rotation on the normal side. For bilateral cases, the brace is set at 70 degrees of external rotation on each side. The bar should be of sufficient length so that the heels of the shoes are at shoulder width. A common error is to prescribe too short a bar that the child finds uncomfortable. The brace should be worn full time (day and night) for the first 3 months after the last cast is removed. 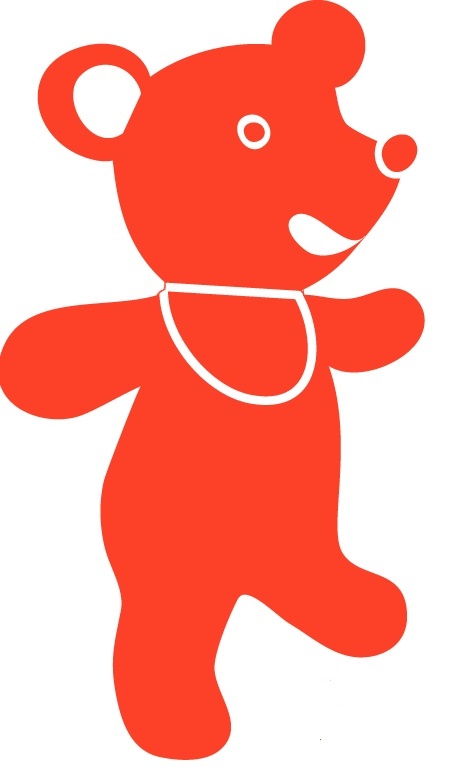 After that, the child should wear the brace for 12 hours at night and 2 to 4 hours in the middle of the day, for a total of 14 to 16 hours during each 24-hour period. This protocol continues until the child is 3 to 4 years of age. Occasionally, a child will develop excessive heel valgus and external tibial torsion while using the brace. In such instances, the physician should reduce the external rotation of the shoes on the bar from approximately 70 degrees to 40 degrees. Setting the bar width. The Dobbs Bar should be set so that the width of the bar is equal to the shoulder width of the child. Dobbs Bar so that the length of the bar is equal to your shoulder width measurement from mid-heel of the left footplate to midheel of the right foot plate. the shoulder width of the child. Once the width is correct, retighten the Phillips head screw(s) to lock the bars firmly in place. The clubfoot should be set at about 60-70 degrees of external rotation, which should match the degree of rotation of the foot in the last cast. If the foot was externally rotated only 60 degrees in the last cast the brace should also be at 60 degrees. A normal, non-affected foot should be fixed on the bar in about 30-40 degrees of external rotation. Attaching the AFO’s. 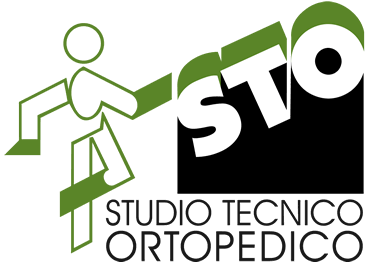 Once the angle of external rotation is set by your physician, therapist or orthotist, simply slide the black piece labeled “PUSH” into the recessed channel on the bottom of the AFO. The piece labeled “PUSH” will pop up and lock the AFO in place. To take the AFO off, press firmly on the part labeled “PUSH” while pulling backwards on the bar until it slides free of the channel. Always use AFOs that are the correct size. A measurement table and size guide are available at www.c-prodirect.com. The correct size AFO is determined by measuring the maximum length and width of the foot. 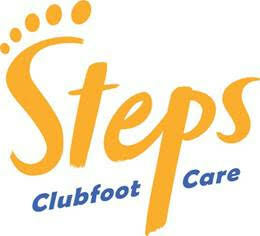 The length of the foot is measured from the sole of the heel to the tip of the big toe. The width of the foot is measured at the widest point (typically at the ball of the foot). Note the length and width of the child’s feet in centimetres and refer to the measurement guide. Based on the length of the feet select AFO sizes that are just longer than the feet; this will ensure there is room for growth. Each AFO size supports a broad range of foot widths. Check the width of each foot is within the range for the sizes of the AFOs chosen. 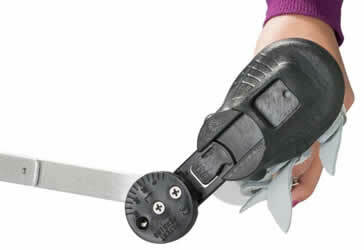 If the foot is either too wide or too narrow for the AFOs then please consult your supplier. Ensure the correct size AFO is selected for each foot; different sizes may be required for the left and right feet. If in doubt contact your clinician for advice. If used consistently in accordance with the instructions below virtually all babies will experience no issues or discomfort and it will not disturb their sleep. The AFOs should be worn with close fitting, smooth, cotton rich socks that extend beyond the top of the AFO. Babies who have just completed plaster casting have particularly soft and sensitive skin. Try to avoid removing the brace because your baby is fussing or disturbed for normal reasons. Babies and young children may soon learn that fussing will lead to removal of the brace. Blankets and sheets may become entangled in the Ponseti AFO and bar or they may kick off their bedding during sleep. Baby sleeping bags (Sleep Sacks) may be used providing they fit correctly. ALWAYS USE CORRECTLY FITTING BABY SLEEPING BAGS. DO NOT USE SLEEPING BABY BAGS INTENDED FOR LARGER OR OLDER CHILDREN. 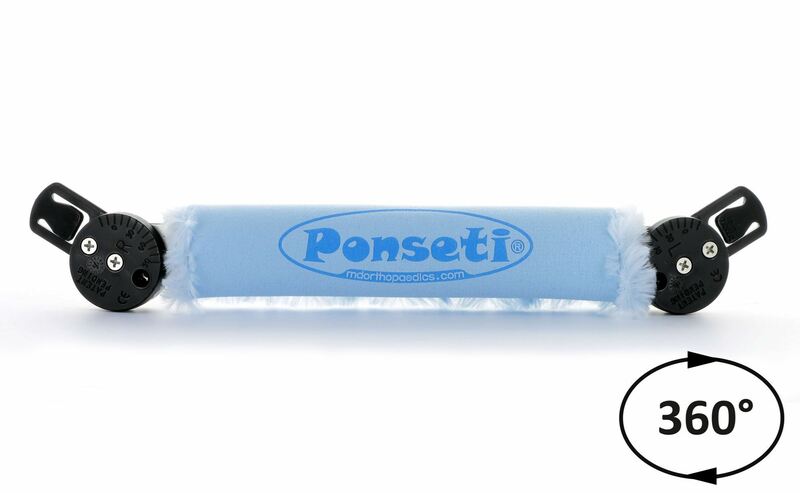 Ponseti AFOs have a straight last and can be worn on either left or right feet. 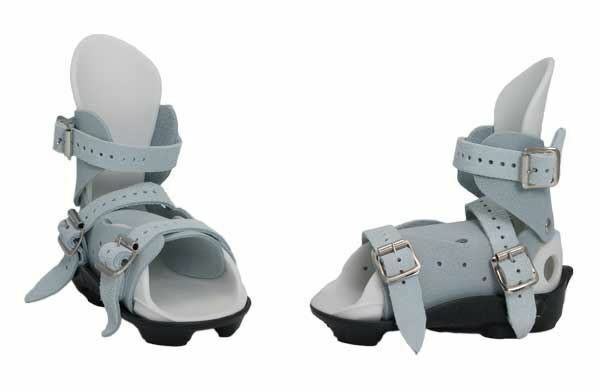 However, most parents find it easier to fit the sandals with the buckles on the medial side (on the inside) of the foot. Unless otherwise requested left and right side sandals are provide this way. 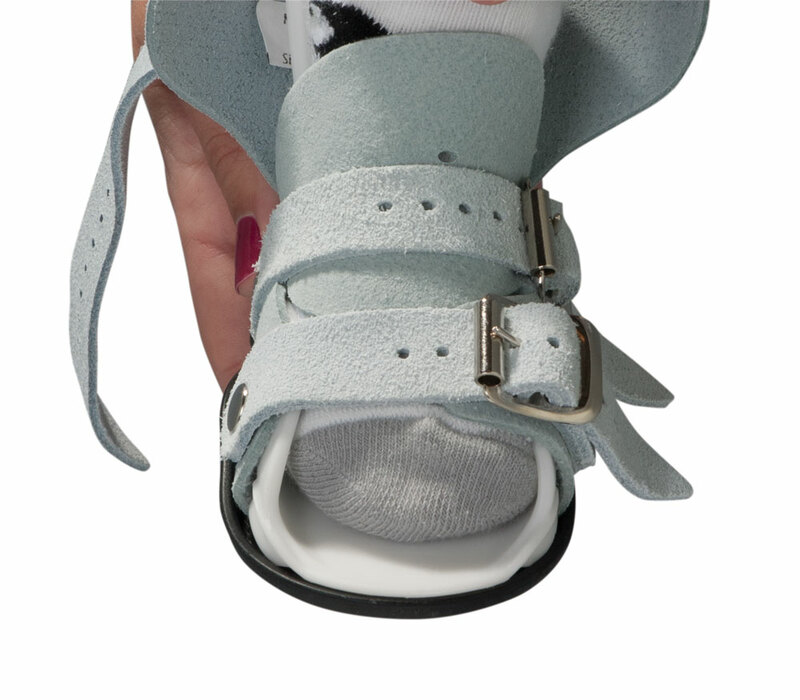 Open the AFO so that all the leather fasteners are clear making it easy to insert the child’s foot. The photographs are of a left foot AFO ❽. This is usually best performed with the baby or young child lying on their back with feet in the air. Slide the foot into the AFO gently working the heel backwards and downwards ❾. Check that the heel is as far back as possible by looking through the holes in the heel of the AFO. Without allowing the foot to move forward, position the tongue as shown ❿. The hole in the tongue should be where the top surface of the foot and the front of the lower leg meet. 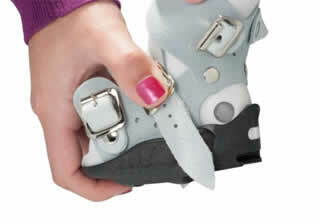 Use your thumb to hold the foot and tongue in place prior to securing the middle strap. Buckle the middle strap over the tongue ⓫. 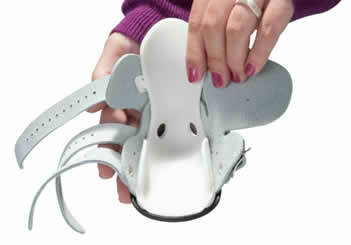 The strap should cover the small hole in the tongue so it acts to hold the foot rearwards and downwards in the AFO. This buckle should be firmly attached so that the AFO position is maintained. A FIRM BUT NOT EXCESSIVELY TIGHT MIDDLE STRAP SECURING THE HEEL IN THE CORRECT POSITION IS NECESSARY FOR EFFECTIVE BRACING. A LOOSE FITTING AFO INCREASES THE RISK OF BLISTERS AND SORES AND UNDERMINES CLINICAL EFFECTIVENESS. The “Pringle” is an optional item. It is a soft rubber piece that fits under the middle strap to create additional cushioning ⓬. Use the Pringle if you find the middle strap is causing patient discomfort. Some reddening of the skin under the middle strap is normal and should be expected. Thread the middle strap through the Pringle as shown ⓭. Secure the middle strap as described in Step 4 above. Inspect the position of the heel in the AFO by looking through the holes and maybe inserting a finger ⓮. If there is a gap between the heel and either the lower or rear surface of the AFO then the fit is not correct. Repeat steps 2, 3 and 4 above as required achieve a correct fit. If you are unable to secure the AFO using the middle strap as described then consult your clinician. In some instances where the foot remains particularly tight after correction it can be difficult to achieve an optimum fit. This usually improves during the first few weeks of using the brace. Note: Larger sizes of AFO have two toe straps. The toe straps cause the front and mid sections of the AFO to wrap around the midfoot and forefoot. Fasten the toe strap(s) ⓯. The strap(s) do not need be very tight, but care must be taken to ensure the midfoot and forefoot are straight and flat (ie., they are aligned to the AFO footplate and inner lining). Care must also be taken to ensure the patient’s toes are straight. When correctly fastened the toe straps will secure the midfoot and forefoot so that there is minimal lateral or upward movement of the foot relative to the AFO footplate. Fasten the top strap taking care not to over tighten and risk constraining blood flow to the foot ⓰. With the baby or child lying on their back attach the bar to the AFOs using the Quick Clips ⓱. In unilateral cases attach the bar to the unaffected foot first. The removal procedure is the reverse of the fitting procedure described above. To remove the AFOs from the bar press the tab on the Quick Clip attachment where labelled “PRESS”. Use and adjust as directed by the patients clinician. Do not use the brace and consult your clinician if the patient is experiencing blisters or sores or if the AFO is slipping in the patient’s foot. Clean AFOs and Bars using warm water only, avoid wetting the suede leather parts. Wear socks under the AFOs. The AFOs are made from high quality non-toxic materials. 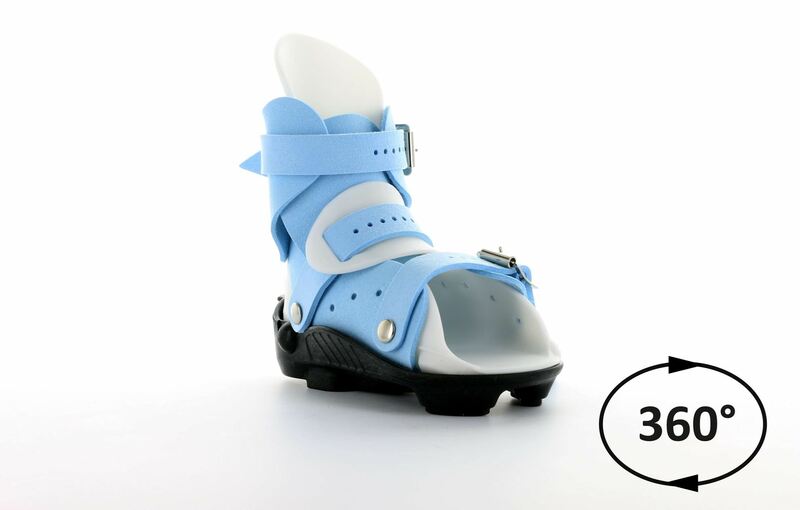 The AFO inner liner is made from Thermoplastic Elastomer (TPE), the outer gauntlet is made from synthetic suede (65% nylon; 35% polyurethane) and the straps may be made from synthetic suede or genuine cow hide. Broken Bar (within 1 year of purchase): Free of charge replacement bar will be provided if there is a manufacturing defect, or if any part of the sandal becomes damaged through normal use.